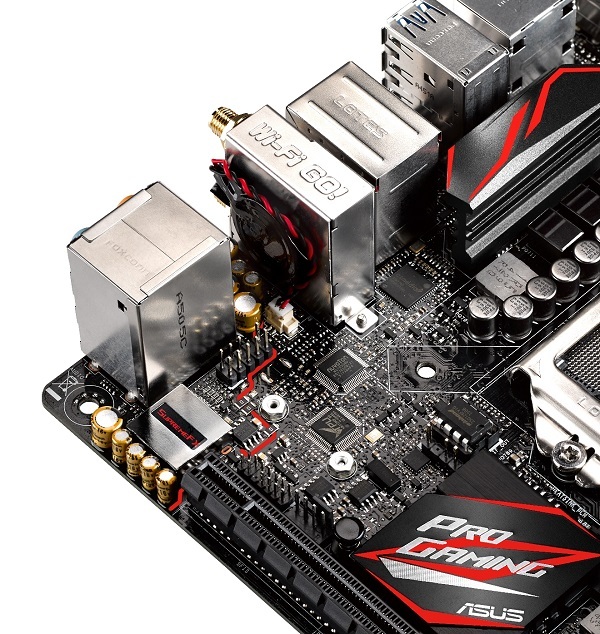 ASUS today announced the Z170I Pro Gaming, a new value-packed mini-ITX gaming motherboard with immersive SupremeFX audio, Intel Gigabit Ethernet with ASUS-exclusive LANGuard and GameFirst to eliminate lag, plus multiple exclusive technologies to boost gaming performance — including ASUS 5-Way Optimization for instant tuning and Pro Clock for exciting new overclocking opportunities. Based on the powerful Intel Z170 Express chipset, Z170I Pro Gaming offers superior gaming transfers from the latest 2x2 802.11ac Wi-Fi with all-new Multi-User MIMO (MU-MIMO) for maximum speed inevery connection, M.2 and USB 3.1 for lightning-speed transfers, and RAMCache for faster game loads. Z170I Pro Gaming also benefits from ASUS Gamer’s Guardian and smart DIY features for superb durability and easier, safer builds. Z170I Pro Gaming is equipped with SupremeFX technology to deliver high-fidelity, near-lossless 115dB signal-to-noise ratio (SNR) audio. The electromagnetically-shielded Realtek ALC1150 codec maximizes acoustic performance and eliminates interference — so only the very best audio is heard through gaming headsets and speakers, with the built-in amplifier able to drive up to 300-ohm headphones. Premium Nichicon audio capacitors produce a warmer, natural sound with exceptional clarity and fidelity, and SupremeFX’s red-line shielding is illuminated for beautiful aesthetics — and it’s even customizable, allowing users to create eye-catching lighting effects. Z170I Pro Gaming also includes Sonic Radar II, a stealthy overlay that shows what opponents and teammates are up to on the battlefield — all managed via a simple control panel and customizable game list. Sonic Radar II shows both the direction and origin of key in-game sounds, enabling ASUS gamers to practice enemy-pinpointing skill. Z170I Pro Gaming drives both online-gaming experience and performance with the latest Intel Gigabit Ethernet (I219-V) to reduce CPU overhead and deliver exceptionally-high TCP and UDP throughput — freeing up more computing power for gameplay. ASUS-exclusive LANGuard’s signal-coupling technology and premium surface-mounted components ensure reliable connections and better throughput, and the LANGuard port is both electrostatically-guarded and surge-protected for 1.9X-greater tolerance to static electricity and 2.5X-greater protection against surges — all the way up to 15KV. New and improved GameFirst optimizes network traffic for faster, lag-free online gaming — and now we’ve added Multi-Gate Teaming, enabling Z170I Pro Gaming users to team all their networks for maximum bandwidth and the smoothest-ever gameplay. GameFirst also includes all-new Intelligent mode, which automatically compiles a database by parsing new app data to ensure that every game is optimized for the best performance. With integrated 5-Way Optimization technology Z170I Pro Gaming users enjoy automated overclocking and unrivaled fan control for instant, highly-controllable performance boosts. This exclusive technology dynamically optimizes essential system aspects based on real-time use for superb CPU performance, everyday energy savings, ultra-stable digital power, cool and quiet fans, and even networking and audio settings tailored for favorite games and apps. 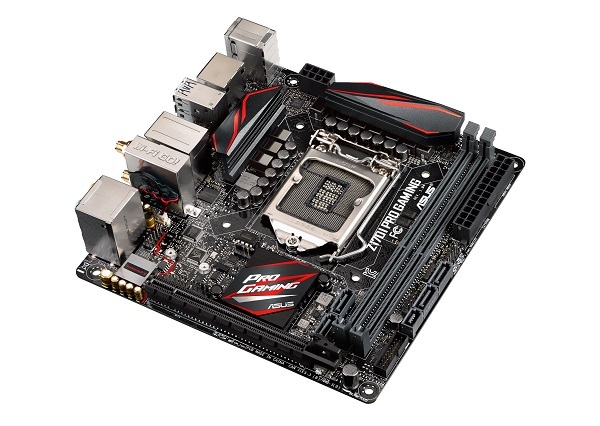 The new mini-ITX gaming board also includes ASUS-exclusive Pro Clock technology, a dedicated base-clock (BCLK) generator designed for 6th-generation Intel processors that allows overclocked base-clock frequencies of 400MHz or even beyond. This custom solution works in tandem with the ASUS-exclusive TurboV Processing Unit (TPU) to enhance voltage and base-clock overclocking control. Boot times can be reduced, jitter is lowered and stability is increased under heavy overclocking — providing an exciting new way to boost performance to extreme heights. Z170I Pro Gaming users are also able to go faster by fitting the very latest DDR4 memory, and push for extreme overclocked-RAM speeds of 4000MHz. Z170I Pro Gaming benefits from next-level 802.11ac Wi-Fi with 2x2 dual-band 2.4/5GHz antennas for up to 867Mbit/s transfer speeds — and the very latest Multi-User MIMO (MU-MIMO) technology to ensure that every connected user experiences the best wireless and online speeds. Physical connectivity is also in abundance with an onboard M.2 socket with x4 PCI Express 3.0/2.0 bandwidth for up to 32Gbit/s data transfers, two USB 3.1 Gen 2 Type-A connectors for data-transfer speeds of up to 10Gbit/s — that’s twice as fast USB 3.0. With uniquely-intelligent RAMCache technology, Z170I Pro Gaming users are able to effectively cache an entire storage device so that favorite games and apps launch at breakneck speeds — and it gets to work the moment it’s activated. RAMCache turns milliseconds into microseconds to boost game-load times to stratospheric levels, and minimizes risk of data loss. Z170I Pro Gaming protects both itself and users with multiple self-defenses called Gamer’s Guardian, including the Digi+ voltage-regulator module (VRM) for ultra-smooth and ultra-clean power delivery to the processor, DRAM Overcurrent Protection, and durable capacitors engineered to resist extreme temperature variations of between -55°C and 105°C — 110% better than the industry standard. Pro Gaming’s stainless-steel input/output (I/O) panels lasts three times (3X) longer than ordinary panels. Smart DIY features include one-clip Q-DIMM memory installation, one-piece Q-connector to sort all front-panel cables, and Q-Shield to prevent nicks and cuts during building. Four Q-LED lamps indicate problems with the CPU, memory, graphics card or boot device for quick diagnosis. ASUS ESD Guards actively protect against sudden electrostatic discharge (ESD), ensuring USB ports, audio and LAN port protection that's up to twice (2X) as resilient as industry standards. ASUS Z170I Pro Gaming will be available in the Philippines by the 2nd week of October with an SRP of Php11,180.